Let«s find out how to make a simple enough laser projector out of electronics you can find at home. That method is most often used in large-scale, industrial laser projectors, but it requires the use of a rather complex electro-mechanical device — the galvanometer — to move the laser quickly. Prices start from $80 a pair and it«s very impractical (though possible) to make at home. The second method is raster scanning. There, the laser beam moves side to side, drawing the image line by line. That«s the method used in old CRT televisions and monitors. Since both vertical and horizontal movements are done repeatedly, it requires a much simpler mechanical setup than vector scanning. Also, since the image is divided into separate elements, it«s much easier to program. The main downside of raster scanning is that the beam goes over every element of the image, even those that don«t need to be illuminated, causing the image to be overall dimmer. But, due the simplicity, that«s the method I chose for my laser projector. To move the laser beam along a line (horizontally), there«s a very convenient technique: is to use a mirror rotating at a constant velocity. Since rotation is continuous, you can move the beam quite fast. But moving the beam to another line is more difficult. The easiest option is to use multiple lasers pointed at the rotating mirror. The downside is that the number of lines displayed would be determined by the number of lasers used, which makes the setup more complicated, plus you would need quite a high mirror. But there are upsides as well — the only moving part of the whole system is the mirror (less stuff to break), and using multiple lasers can make the image brighter. Here«s an example of a projector built that way. Another scanning method, often found on the Internet, is combining vertical and horizontal scans by using a spinning mirror drum, where separate «facets» are placed at different angles to the rotating axis. That mirror configuration makes the laser beam reflect into different vertical angles when the mirror is spinning, creating a vertical scan. 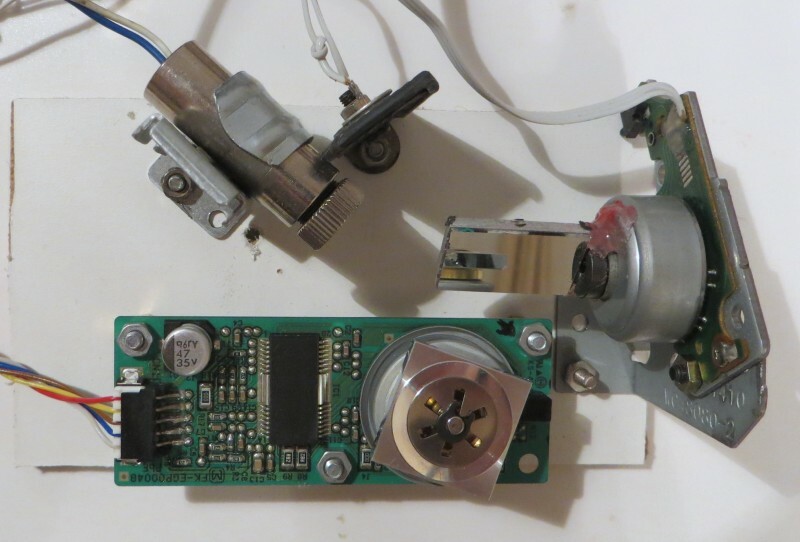 Even though the resulting projector is quite simple in essence (you only need a laser, a mirror with a motor and a synchronization sensor), this method has a big downside — it«s very difficult to build a multi-faceted mirror at home. Usually the slant of the «facets» should be adjusted perfectly during construction, and the level of precision required is insanely high. Here«s an example of such a projector. I couldn«t find documentation for the module or the chip inside it, so to determine the module«s pin layout I had to reverse-engineer it. Power lines are easy to locate — they«re connected to the only electrolytic capacitor on the PCB. But simply getting power to the engine isn«t enough to make it spin — you need to also supply a clocking signal to set rotation speed. The signal is a simple meander of the frequency from 20 to 500–1000 Hz. To find the right line, I grabbed an impulse generator configured for 100 Hz, and connected it (through a resistor) to every available line of the laser module port. Once the signal is supplied to the correct line, the engine starts spinning. Mirror rotates plenty fast for our purposes — as later measured, it spins at a speed over 250 RPS. But unfortunately, the engine«s rotation made it quite noisy. 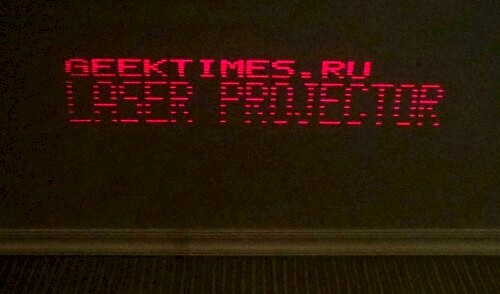 It«s not a problem for my experiments, but would certainly be noticeable when the projector is complete and working. Maybe it could be mitigated by using a newer mirror module or just putting the module in a box. Since we use raster scanning, laser light is distributed along the entire area of the image, which makes the image quite dim — it«s only visible in the dark. To enable the microcontroller to track the position of a moving laser beam, we need a photosensor. 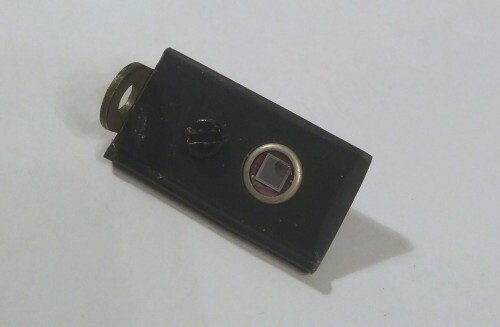 But that purpose I used a photodiode obstructed with a piece of cardboard with a small hole in the middle. It«s needed to track the moment the beam hits the photodiode more precise. As I mentioned earlier, I used a periodically oscillating mirror to form the vertical scan. How do you drive it? The easiest way is to use an electromagnet. Sometimes people just mount the mirrors on top of computer speakers, but it«s not a particularly desirable option (results are inconsistent, too hard to calibrate). 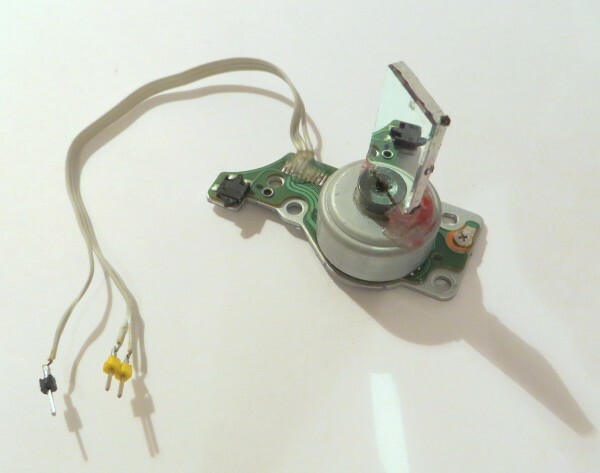 In my build I used the BLDC motor from a DVD player to control the vertical scan mirror. Since the projector was intended for outputting text, there weren’t many lines to draw, which meant that the mirror should only be angled slightly. The BLDC motor consists of three coils, which together make a stator. If one of the coils is connected to a positively-charged power source, and the other two are alternately connected to the negatively-charged source, the engine«s rotor would wobble. The maximum angular sweep is determined by the motor«s configuration, specifically — the number of poles. For a DVD motor it doesn’t exceed 30 degrees. 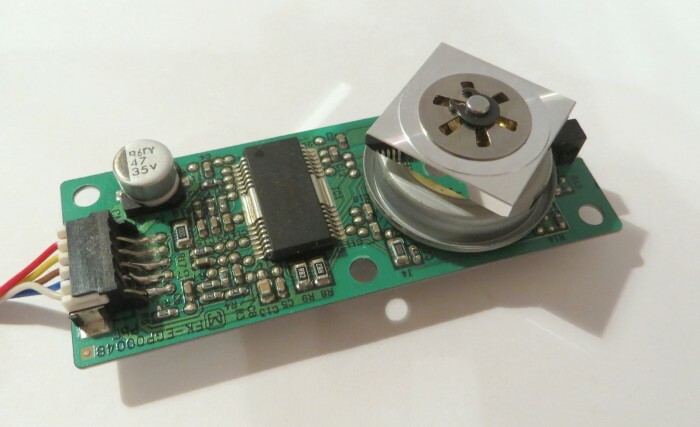 Since this motor is quite powerful and easy to control (only two keys are required), this motor fits very well for our purpose of building a text laser projector. Note that the mirror«s reflective surface should be on the front — meaning, it«s not obstructed by glass. 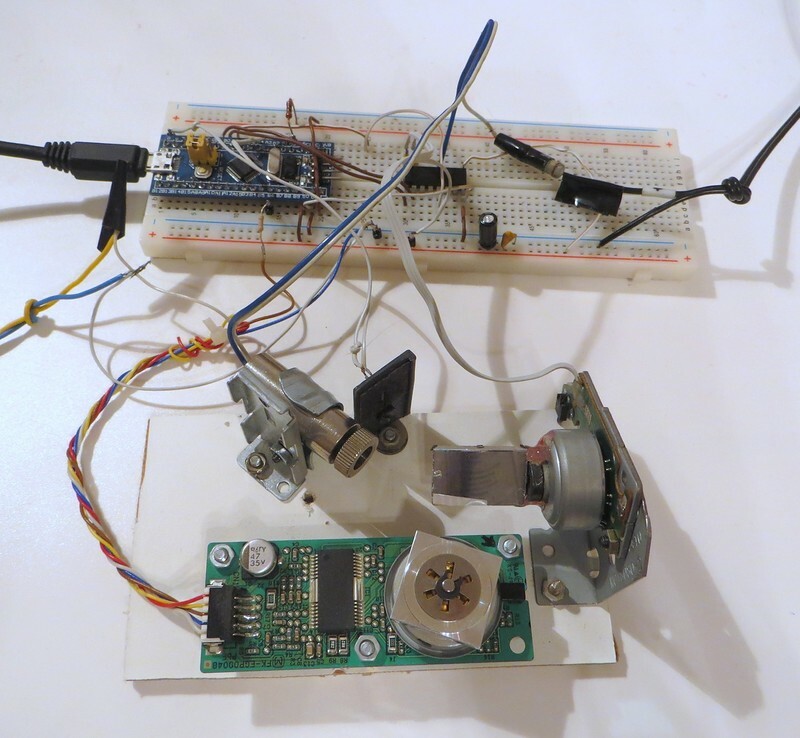 As you can see from the picture, the laser and the projector«s mechanical parts are controlled by the STM32F103 microcontroller installed on a small debugging board (Blue Pill). This board is installed into the breadboard. As I mentioned earlier, to control the polygonal mirror motor we need only one signal — the clocking signal (POLY_CLOCK) that«s produced by one of STM32«s timers working in PWM mode. Its frequency and duty ratio are unchanged while the projector is working. To power the motor I use a separate 12V power supply. Unfortunately, the current version of the projector doesn’t provide feedback on mirror location. It means that the microcontroller can drive the mirrors, but it doesn«t «know» it«s current position. The rotor inertia and the coils inductance produce some delays in changing the rotation direction. A lot of lines are not operational. The vertical scan mirror vacillates in cycles, so some of the lines could be output downside up, and the other — upside down. A a result, since we can«t track position, lines could only be displayed while the motor is rotating a particular way. Since only half the lines are being displayed, the brightness of the image is halved. 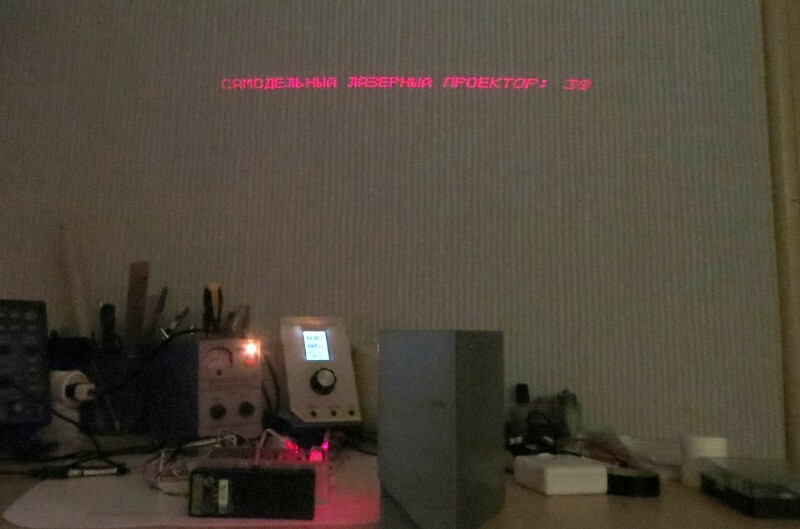 After the image output is over, the laser should be turned on again, so the photodiode could again accept its beam. Laser modulation is done through one of the keys of the ULN2003A chip. 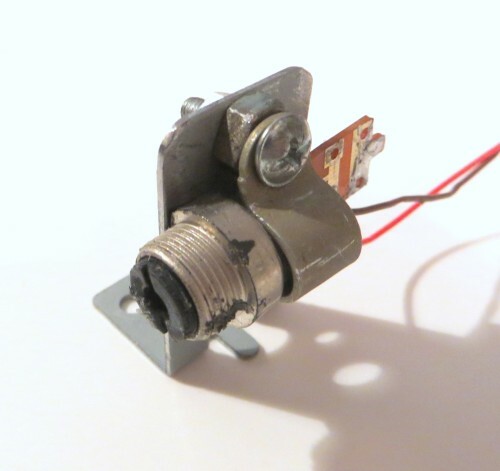 The R3 resistor is needed to protect the laser diode from overcurrent. It«s installed right at the end of the laser cable, insulated. To power the laser I used an outboard power supply. It«s important to control the laser current consumption and make sure it«s within the acceptable range for the particular laser diode. The video makes the image flicker vertically, but it«s not visible in reality.